As the GOP push to pass “tax reform” starts to heat up, policymakers will debate whether the corporate tax rate is too high or too low. A standard but misleading talking point for those wishing to give more tax breaks to corporations is that the United States has one of the highest statutory rates in the world at 35 percent. This is misleading because what corporations actually pay (their effective rate) is far lower. The corporate tax code is riddled with loopholes, most notably the deferral loophole which allows large multinational corporations to avoid paying their taxes indefinitely on profits they make offshore. 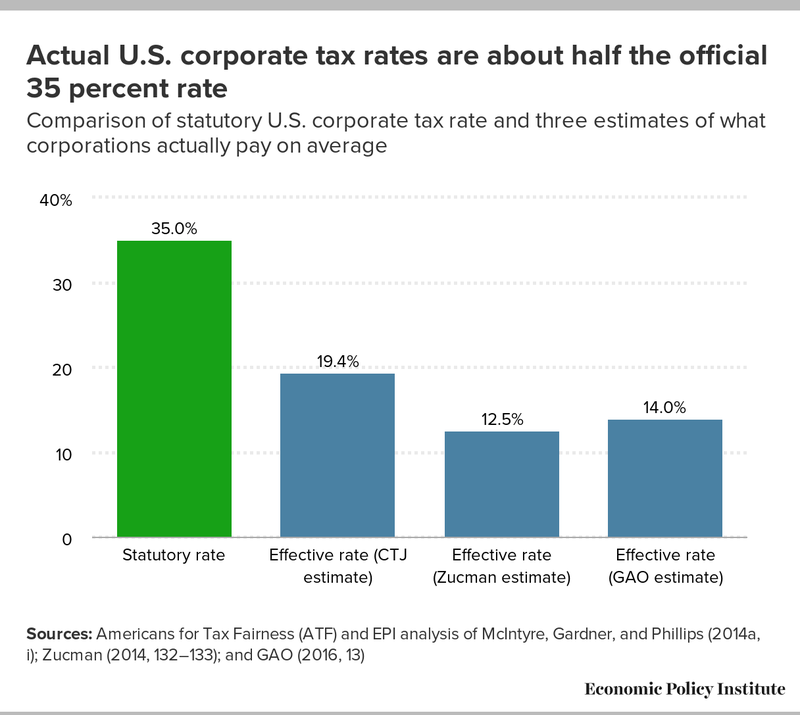 And despite some recent claims to the contrary, a recent CBO report doesn’t overturn, but rather bolsters the research showing that corporations pay less than a 35 percent tax rate. Due to data limitations, it’s hard to come up with one conclusive rate. But multiple studies with distinct methodologies have found effective federal corporate tax rates that range between 13 and 19 percent— far smaller than the rate corporations are supposed to pay. Real tax reform would close the deferral loophole and ensure that large multinational corporations cannot continue to dodge the taxes they owe. Instead, the Trump administration has reversed its position on commitments to close the deferral loophole, and their most recent proposal followed congressional Republicans’ plans to institute a territorial tax system, which would no longer tax multinational corporations’ offshore profits at all. At its core, a territorial tax system makes the deferral loophole permanent. This would cause an enormous revenue loss. In hopes that Congress would pass a repatriation tax “holiday” (as happened in 2004), large multinational corporations have used the current deferral loophole to book $2.6 trillion in profits offshore. The corporate tax base is likely to erode far more if this deferral loophole were made permanent. The United States could benefit from real tax reform that clawed back the taxes that large multinational corporations have been dodging. Instead, the Trump administration is offering to make the deferral loophole permanent and to open up new loopholes for the rich. If policymakers wanted to help working people through tax reform, they would broaden the tax base by closing loopholes and make corporations pay their fair share.